A parliamentary report of 1777 recorded parish workhouses in operation at Eton (for up to 40 inmates) and Iver (60 inmates). A workhouse is believed to have opened in 1790 on Holmlea Road in Datchet. Buckinghamshire: Burnham, Datchet, Denham, Dorney, Eton (2), Farnham Royal, Fulmer, Hedgerley, Hedgerley Dean, Hitcham, Horton, Iver (2), Langley Marish (2), Lower Boveney, Stoke Poges, Taplow, Upton with Chalvey, Wexham, Wyrardisbury (or Wraysbury). The population falling within the union at the 1831 census had been 18,137 with parishes ranging in size from Hedgerley Dean (population 29) to Eton itself (3,232). The average annual poor-rate expenditure for the period 1832-35 had been £12,964 or 14s.4d. per head. "...as a proper mark of respect to the King and in justice to Sir Jeffrey Wyatville, the Architect appointed to Build the Union workhouse should be instructed to communicate with Sir Jeffrey Wyattville with respect to the front presented by the new house towards Windsor Castle, the Board wishing to do all in their power consistent with that economy that they are bound to exercise towards making the new Building as little injurious to the view from the Castle as the nature of it will permit." In August 1835, a tender of £4,559 was accepted from Mr Hollis for the building of the workhouse which was to hold up to 440 inmates. Construction took place in 1835-6 with the total cost amounting to £5,350. The workhouse location and layout are shown on the 1923 map below, by which time the workhouse was officially known as a Poor Law Institution. Eton - view from southern entrance, 2000. The main building, now known as Fir House, consisted of an entrance block which contained a porter's lodge and waiting room, with the Guardians' board-room above. The blocks to each side later became wards for vagrants staying overnight at the workhouse. Eton - south range, 2000. Male inmates were accomodated at the eastern side of the workhouse and female at the west. Boys' and girls' schoolrooms lay at each end of the front block. Eton south range and girls' schoolroom from the south-west, 2000. Behind the entrance block, the master and matron's quarters connected to the central supervisory hub which had windows placed to give a view over each of the yards. At the west and sides of the hub were the women's and men's halls with dormitories above, while the kitchens lay in the north wing and the laundry at the north-west corner. The original workhouse infirmary occupied the north side of the building. Eton - north-east courtyard from east, 2000. 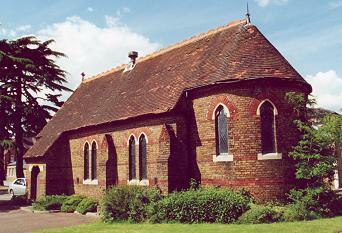 To the south of the entrance block is the chapel, probably dating from the 1860s. Eton - chapel from the east, 2000. 1. The beds in one of the old women's rooms are only 5 ft. 6 in. in length, and, in fact, were those for the schoolgirls; they are not long enough for adults. 2. The old women sleep two in a bed; this system has been very generally abolished elsewhere, and as there is very abundant room in the workhouse, I suggest the propriety of abolishing it here. 3. Some of the wards are too full, the sick wards chiefly. Not less than 5 ft. 4 in. of floor space should be allowed to each bed. Some of the rooms, [such] as the foul men's ward, were very close, and required both fewer beds and improved ventilation. Ventilation, by means of air bricks at the top of the side-walls, and covered with perforated zinc, is the simplest and most efficient method. 4. I do not think that five lying-in women should be placed in the lying-in ward at the same tune. 5. The Crimean bedsteads are very rigid, and as these are without any mattrasses, great care should be taken to keep the flock beds well filled. 6. The porter does not keep a book in which he enters the names of persons entered and leaving the workhouse, as directed by the Poor Law Board. 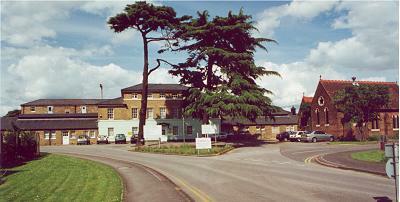 Sometime after the original construction, an infectious hospital was added at the north of the site. In 1906, the Board of Guardians were authorized to spend £7,700 on the erection and fitting out of a separate infirmary at the west of the workhouse. A mortuary was located to its north. Eton - 1906 infirmary from south-east, 2000. In May 1900,	a well-dressed baby girl was found crying underneath the seat of a train at Slough station. The child was taken to the workhouse and placed in the care of the matron while the guardians tried, in vain, to find its mother. Within a week, following the publicity attending the incident, five ladies, including a clergyman's wife, had applied to the master of the workhouse for permission to adopt the girl. She was eventually placed with what was described as 'a family of considerable means at a fashionable health resort'. 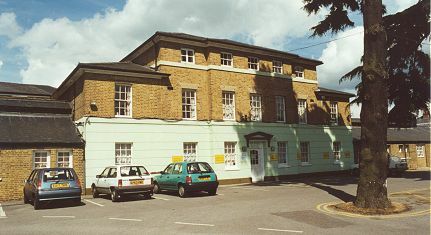 After 1930, the site was redesignated as a Public Assistance Institution known as Albert House and was under the control of Buckinghamshire County Council. 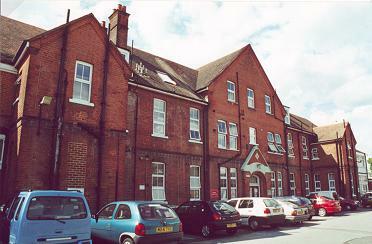 After 1948, the site became part of the National Health Service under the name of Upton Hospital.